Spokane native Tyler Olson appears to have won final spot in the bullpen. 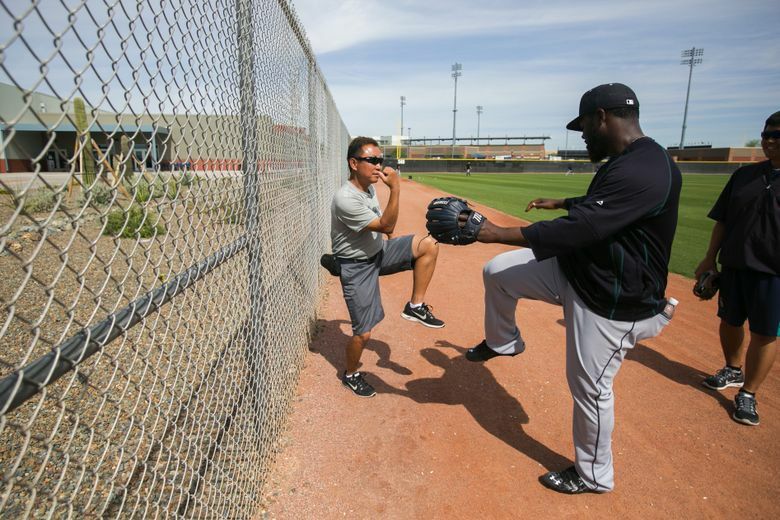 PEORIA, Ariz. — Though it isn’t official and announced by manager Lloyd McClendon, the opening day roster of the Mariners became readily apparent on Sunday after a series of cuts from major-league camp. 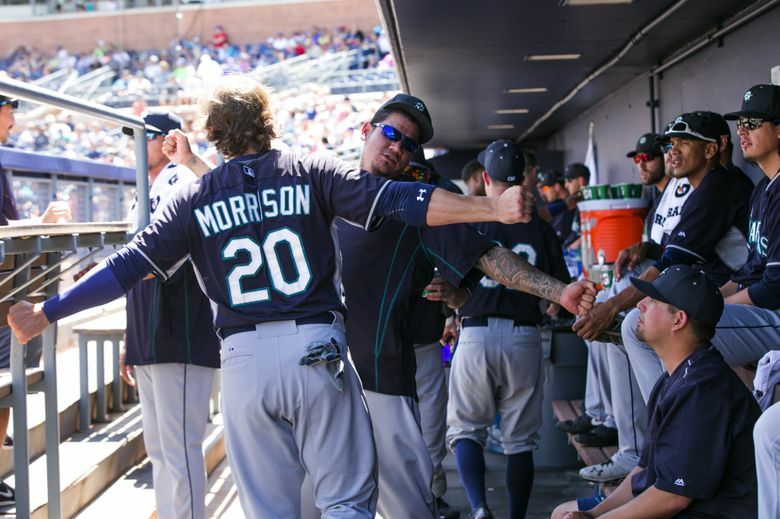 The Mariners whittled their spring training roster to 28 players and, with shortstop Chris Taylor and pitcher Edgar Olmos injured, it’s easy to see who will be traveling north on Saturday. 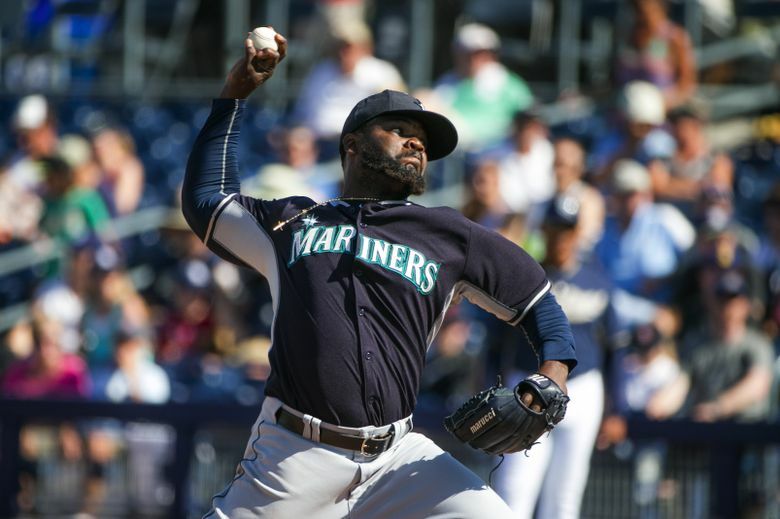 Left-handed starting pitcher Roenis Elias and right-handed reliever Carson Smith were optioned to Class AAA Tacoma. Meanwhile, eight players who are not on the 40-man roster were reassigned to minor-league camp: Right-handers Jordan Pries, Mark Lowe and Kevin Correia, left-hander Joe Saunders, infielders Shawn O’Malley, Carlos Rivero, catcher John Baker and outfielder Endy Chavez. Notable: Starter J.A. Happ had an uneven start, giving up six runs (five earned) on 11 hits with two walks and three strikeouts in five innings. Happ was ambushed on the first pitch of the game when Padres leadoff man Wil Meyers hit the first pitch over the wall in left-center. Justin Upton also hit a solo homer in the first inning. “I was being way too tentative early on,” Happ said. “I don’t really know what the reason was. But it showed. 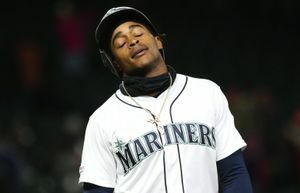 But I finished strong and felt like I could go out there and keep going.” … minor-leaguer Jabari Henry, who was making the start in right field after Seth Smith and Alex Jackson were scratched, hit a solo home run in his first at-bat and later added an RBI single. 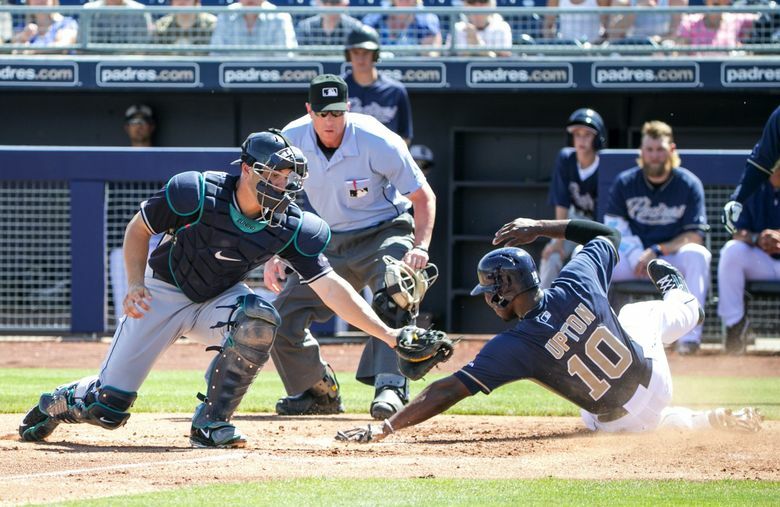 … Mike Zunino reached base three times. Player of the game: Dustin Ackley continues to have a solid spring for the Mariners, going 2 for 3 with a double and two-run homer — his first in Cactus League play. For the spring, Ackley is hitting .366 (15 for 41) with 10 RBI and a .946 on-base plus slugging percentage. But beyond the results, Ackley is driving the ball to all fields and not giving away the outside strike. His home run went over the wall in left-center, which is a good sign he’s seeing the ball well. Quotable: “He swung the bat extremely well today. I was very pleased. He attacked early. He was aggressive in the zone. 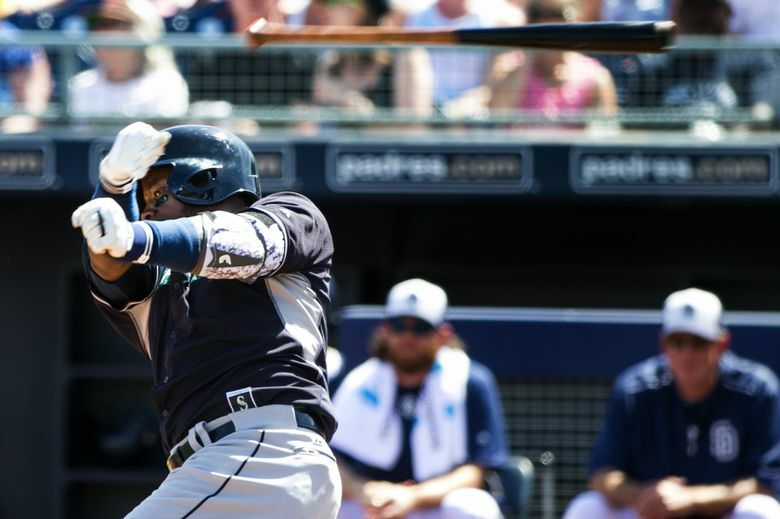 I thought he had three good at-bats.” — Manager Lloyd McClendon on Ackley’s day. 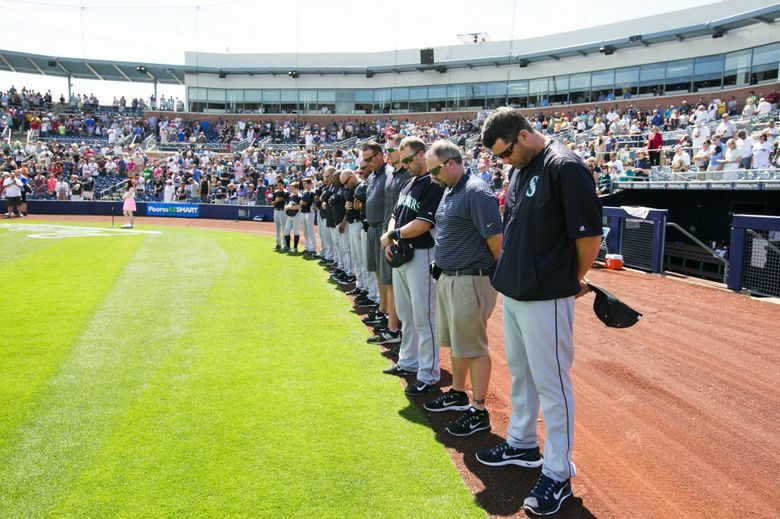 On tap: The Mariners are back at Peoria Stadium for a third straight day and hosting the Los Angeles Angels. Right-hander Taijuan Walker will get the start for Seattle, while right-hander Nick Tropeano will start for the Angels. First pitch is set for 1:05 p.m. The game will be televised on Root Sports and MLB.tv and broadcast on ESPN 710 and mariners.com. With those moves, the spots in the starting rotation and bullpen seem to have been chosen. 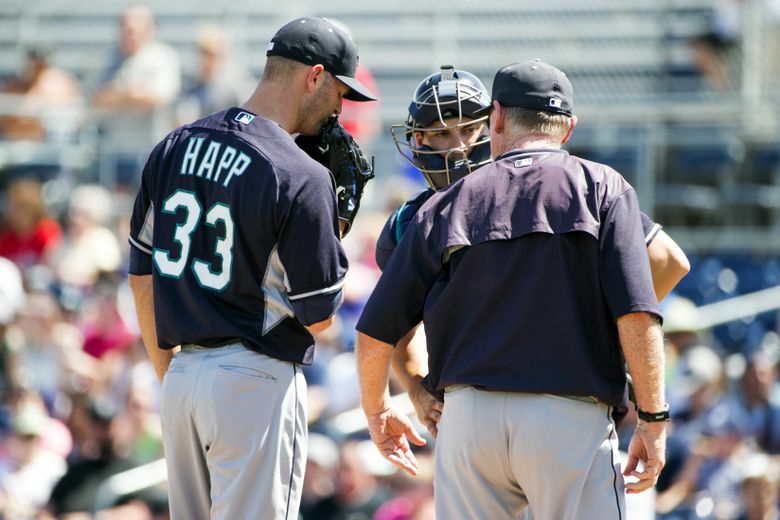 Elias had been battling with right-hander Taijuan Walker and to a lesser extent right-hander Erasmo Ramirez for the final spot in the starting rotation. While Walker has thrown 18 scoreless innings this spring with 19 strikeouts, Elias has struggled at times, going 0-2 with a 6.75 ERA and showing erratic command. With Walker and James Paxton on innings limits and McClendon wanting to make sure Felix Hernandez and Hisashi Iwakuma remain strong in September and possibly October, the Mariners will likely use a modified six-man rotation at times, calling up Elias and finding ways to get pitchers extra rest days. McClendon wouldn’t officially announce Walker as the No. 5 starter with Ramirez still in camp. But that seems to be a foregone conclusion, considering Ramirez hasn’t pitched particularly well this spring and is out of minor-league options. With Carson Smith, Lowe and Saunders cut from camp, it appears that left-hander Tyler Olson has won the last spot in the bullpen. The Spokane native and Gonzaga grad pitched an inning Sunday, but the two runs scored off him were unearned because of errors. He hasn’t allowed an earned run in nine appearances and 102/3 innings pitched. Smith seemed to be the other possible candidate. The side-armer was brilliant as a September call up last season. The only way Olson doesn’t make the team is if the Mariners decide to move Ramirez to the bullpen as a reliever instead of being forced to designate him for assignment. He has pitched in the bullpen a little in his career, posting a 3.74 ERA in 12 relief appearances. 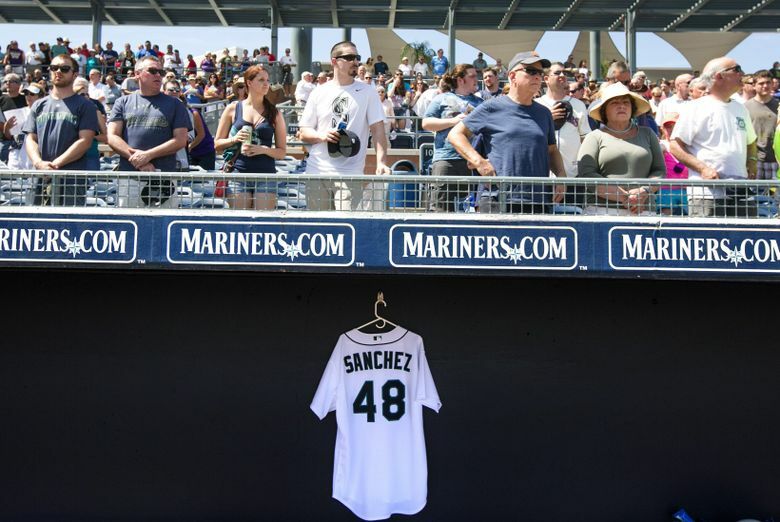 The passing of young prospect Victor Sanchez was being felt in the Mariners clubhouse on Sunday morning. Sanchez died late Saturday evening. 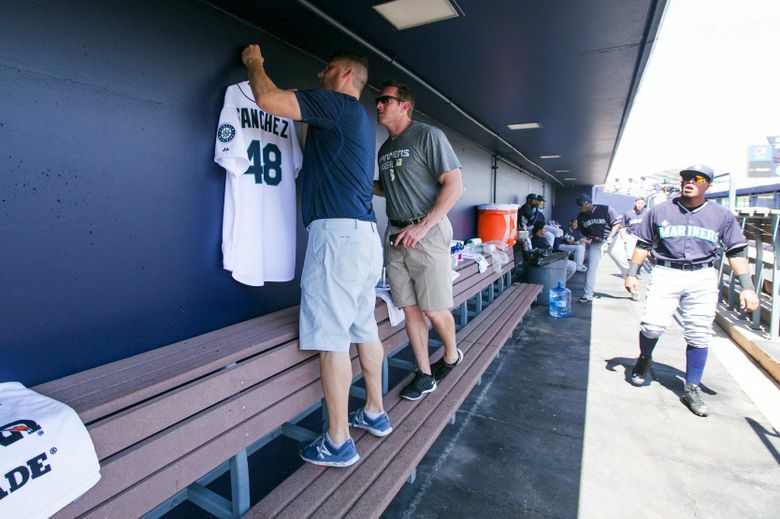 As a tribute, the Mariners hung his jersey in the dugout during the game and there was a moment of silence in his honor. • Outfielder Seth Smith was scratched from the lineup on Sunday with a swollen right ankle. 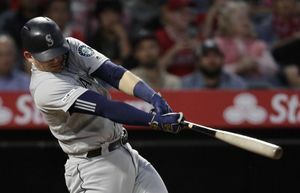 Smith rolled the ankle sliding into home in Saturday’s game as he scored from first on Robinson Cano’s double to left. McClendon said the decision was more precautionary. “Seventh game of the World Series, he’d be in there,” McClendon said. His initial replacement — top draft pick and hitting prospect Alex Jackson — was also scratched just before game time as a precautionary move. Jackson felt soreness in his shoulder after diving for a ball in the outfield in a minor-league game on Sunday. • Chris Taylor is recovering well from the fracture of the triquetrum bone in his wrist. He began throwing on Saturday. He will take “dry swings in a pool” today, per McClendon. Yes, dry swings in a pool. Dry swings means not hitting a ball.